Welcome to our website. Electric smoker adds great value to your cooking by improving the taste of your food. You can enjoy the juicy flavor of smoked food almost effortlessly because It is really easy to use an electric cooker. Many people think that cleaning the smoker is a tough row to hoe. Starters are discouraged to begin their cooking with a smoker as it attracts a lot of greases, oil, food residue, ashes and other types of debris. However, cleansing can be done easily by following the instructions mentioned below. Abrasive cleaning solution can lead to corrosion, grime or sticky oils on the surface of the smoker. Therefore, the cleaner must be non-abrasive. Any soap or detergent mixed with warm water will be an ideal cleaning solution. Apple cider vinegar has been used widely for wiping grease, oil and other residue from the smoker. Besides, there are plenty of cleaners available in the market. However, you should exercise precaution by buying a less aggressive cleaning solution. 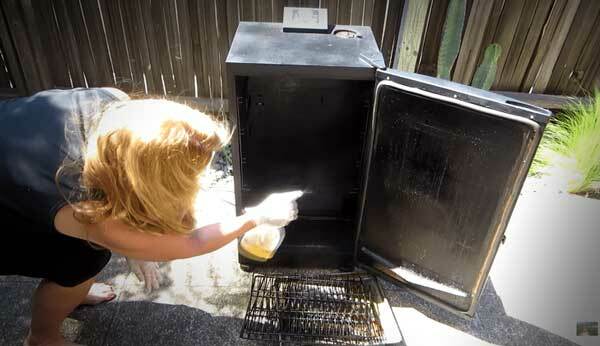 We are providing a step by step guideline so that even newbies can clean the smoker accurately. Let the smoker cool down first and then remove the smoke box. Dump the ashes into a plastic bin and use a rag to rinse the box with warm water. Take out other removable parts such as the cooking racks, drip trays, water pans etc. Soak them in soapy hot water for thirty minutes. It will take out the stickiness and cleanse all the pieces. Then you need to rinse them and rub them with a sponge or a bristle brush. After drying them up, apply some vegetable oil to keep all the parts protected from rust. To clean the cooking chamber, you must take out every removable part from the smoker. It is also essential that the smoker is cold before you take your hands inside the cooking chamber. We do not recommend to wash the inner part of the cooking chamber. However, you can soak a sponge in soapy water or filter water and wipe the inner surface carefully. A plastic bristle brush can also be used to clear the debris from the surface. But, do not use a metal brush at all. Make sure that there is no loose bristle lying inside the chamber after you are done. You can use some dry newspaper to wipe the surface again. It will ensure you that there is no chance of leaving behind any loose parts. The next thing to do is to clean the outside surface of the cooker. Apply some detergent in warm water and soak in a soft towel in the solution. Wipe it dry and keep the smoker out in the open for a while. You need to regularly clean the residue from the door seal and the glass door using a damp cloth. Just swab it carefully to take out the residue that forms after every time you use your smoker. You can't soak the cloth in soap water when you are cleaning the glass door. You should only use the cleaning solution suggested by the makers or the solutions that are approved for use on ceramic glass. There are two thermostats that can be found near the rear inside end of the smoker. It is necessary to clean the surface of both the thermostats as they are essential for maintaining the temperature of your smoker. You should also carefully clean the meat probe. You shouldn’t rinse them or immerse them in running water. Rather, use a damp cloth to mop the scraps away from the surface. Do not worry if you find out that the inner surface of the chamber is becoming darker day by day. The dark state signals the existence of rust on the surface which will enhance the performance of the infrared system of cooking. Clean your electric smoker after every use and cleanse it thoroughly after a while. Know that if you do not clean it properly and accurately, your cooker’s performance will degrade gradually.